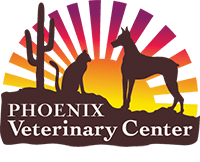 Phoenix Veterinary Center is a full service small animal hospital for cats and dogs. Our veterinary services include preventative physical examinations, doggy dental care and routine elective spay to name a few. Our practice's mission statement is care, compassion, communication. A simple statement that covers our beliefs. We strive to provide the absolute best medical care for our patients.